Who else LOVES Girl Scout Cookies? Even though I do plenty of baking myself, I still look forward to Girl Scout Cookie season every year. I know, funny that we think of them as having their own season but they are just that tasty and certainly deserve it in my opinion. Mine is, of course, Thin Mints! Straight out of the freezer. We don't even bother with putting the boxes in the cupboard anymore. We head straight to the freezer when we get them home and tuck them in their shiny foil bags right into the cold, Brrrr. Then we wait as if patiently for them to be just the right temperature to eat. Oh, and I also LOVE the shortbread cookies! I remember when I was little and was in Girl Scouts and they were called Scott T's (I think that's the right spelling) and they had a little sprinkle of sugar crystals on top, Mmmmm. I think it's a toss up which I love more because they are both so tasty! 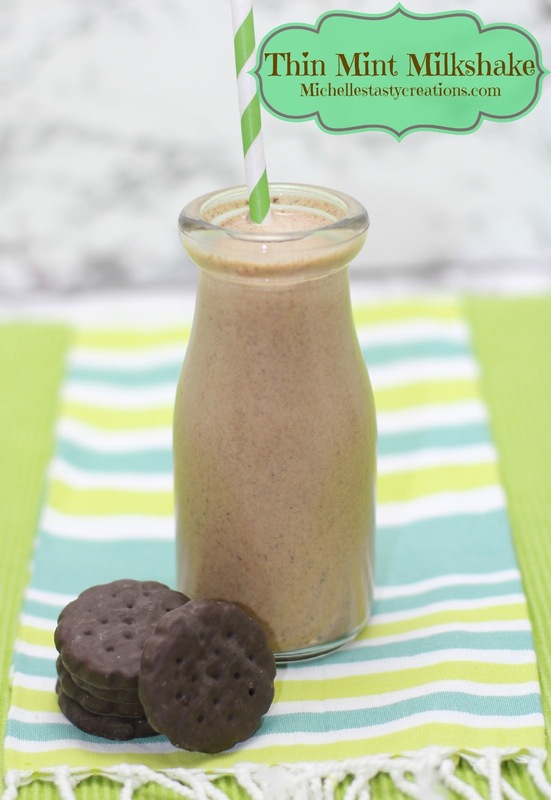 This year I already had in mind what I wanted to do as soon as I bought my first box of Thin Mints...............MILKSHAKE! In a blender, mix the milk, ice cream, and chocolate syrup until well mixed and the thickness you like. Add the frozen cookies and blend for a minute or two until all the cookies are incorporated. Oh my goodness this sounds amazing! I would love it if you linked this up at my Sweet & Savoury Party!! I know exactly what to do with my box of Thin Mints (well except eat them, of course!). Thanks for sharing this great recipe. oh yummy! I don't think my cookies ever last long enough to do more than just eat them, lol. I might need to sneak some into the freezer. thanks for linking up at the Sweet and Savoury Link Party. Hope to see you there again tomorrow!